We are a leading Manufacturer of rubber strainer extruder and rubber refiner mill (reclaim rubber machinery) from Mumbai, India. Rubber Strainer Extruder are used for removing the oversize, unwanted material from the reclaimed rubber using fine mesh in the head. Our firm offers extruders for Reclaim projects from size 150 MM to 200MM. Scroll and sleeve are made of EN-41 B Material, presicely ground on OD and profile –nitrided to 900 +50Hv. Hinged type powered feed rollers are provided. Two strainers Heads hinged type are provided with quick locking type mechanism. 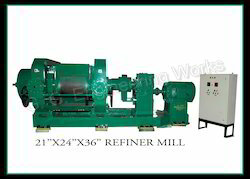 We are one of the prominent providers of a premium quality range of Rubber Refiner Mill. This refiner mill is assembled and designed by utilizing excellent quality components at our well-equipped production unit under experienced professionals. The offered refiner mill is widely used for refining huge amount of waste rubber items. This refiner mill is properly tested by our quality controllers as per defined parameters. Moreover, we offer rubber refiner mill at industry leading prices for our valuable customers.